Codling moth (CM) -- 1st generation, first sustained trap catch biofix date: May 16, Saturday. Codling moth development as of June 9: 1st adult emergence at 24% and 1st generation egg hatch at 0%. In most orchards, insecticide targetted against plum curculio and apple maggot prevent codling moth damage. If targetted codling moth control is needed, key management dates are shown here: 1st generation 3% CM egg hatch: June 18, Thurssday = target date for first spray where multiple sprays needed to control 1st generation CM. 1st generation 20% CM egg hatch: June 25, Thursday = target date where one spray needed to control 1st generation CM. Obliquebanded leafroller (OBLR) -- 1st generation OBLR flight begins around: June 9, Tuesday. Early egg hatch and optimum date for initial application of B.t., Delegate. Proclaim, Intrepid, Rimon, Altacor, Belt, pyrethroid or other insecticde effective against OBLR (with follow-up applications as needed): June 23, Tuesday. 10-June, 2015 (Wednesday) Mass. Fruit Growers' Assoc. in cooperation with Essex County (MA) Fruit Growers, UNH Cooperative Extension,and UMass Extension Fruit Twilight Meeting. Parlee Farms, 95 Farwell Rd, Tyngsboro, MA. 5:30 PM.Pizza for a light supper (and strawberrry shortcake). 1 pesticide re-certification credit. Special guest: Tom Callahan, Adams County Nursery will talk apple and peach varieties, horticulture, rootstocks, etc. Alan Eaton, UNH Cooperative Extension will discuss current pest status. I've already said plum curculio are still active and need preventive insecticide. With the heavy downpours we have been having, one wonders about how long an insecticide application will last before the rain washes it off? This has been the topic of internet chat recently too. Many have referred to John Wise's recently updated article "Rainfast characteristics of insecticides on fruit" from Michigan State University. Worth a read and good reference. Apple Scab – We’d like to be able to announce that this unending primary scab season has finally ended. Unfortunately, while it’s getting close, we are still seeing a lot of ascospores ready to go, and still catching them in our trap tests. We think this delayed maturity is related to the very dry weather we had for a few weeks. During the dry spell, scab development, which had not progressed very far, shut down completely. After two to three weeks, it started up again, but has remained well behind what we would expect to see in a normal year at this stage of apple growth. Hopefully it will end by next week. 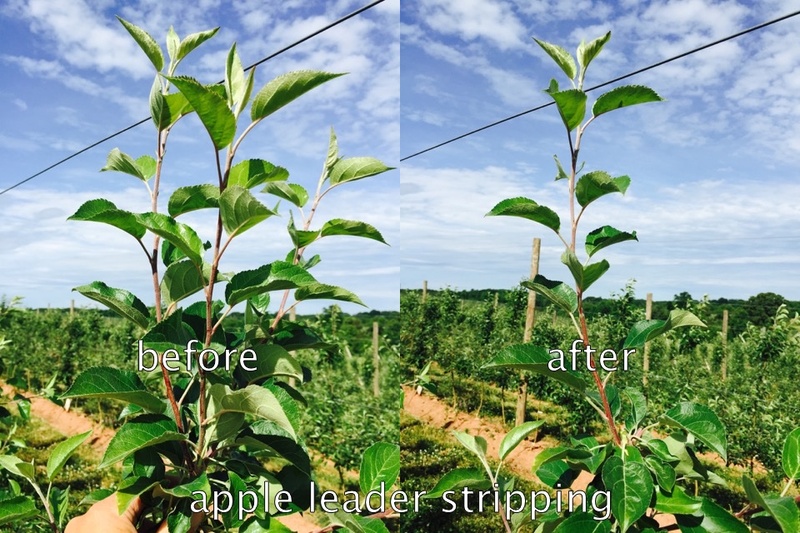 We have seen the first scab spots on leaves in check trees at the UMass Orchard. They trace back to infection on May 27 – 28. That was about a week after McIntosh petal fall at the UMass orchard. We have not seen scab develop from any other infection periods yet. 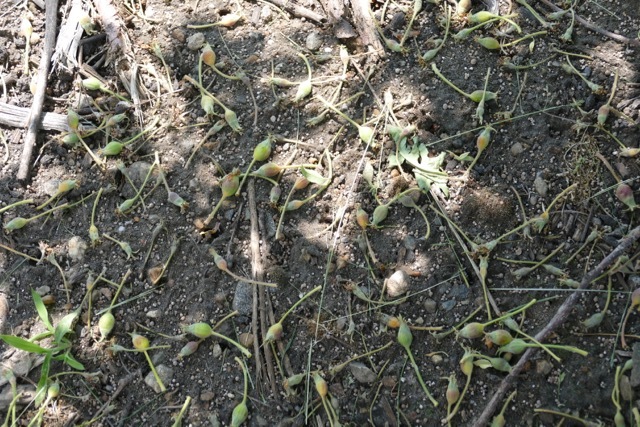 Fire Blight - We have confirmed a couple of cases of fire blight. However so far not much has shown up. In fact, surprisingly little fire blight has appeared given the weather before and during bloom. We’d like to take some credit, and congratulate all the growers who sprayed strep more than they normally might. However, I think the dry weather also deserves credit. All indications were that bacterial populations soared to unprecedented levels this spring, but in many areas we never had the rain necessary to cause flower infections. Having said that, some areas did get rain during bloom, and we have seen two cases of fire blight so far. And you may remember that last year fire blight appeared late as shoot blight though we had very little blossom blight. According to MaryBlyt, today is the first day we would expect to see shoot blight symptoms at the UMass Cold Spring Orchard. 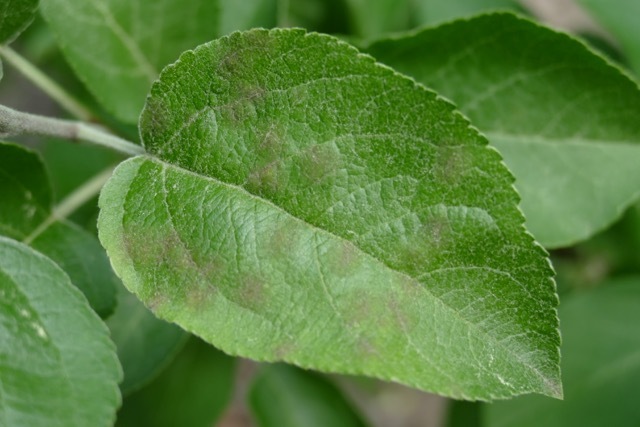 Keep your eye out for shoot blight. Again, if you suspect you have fire blight, please contact Jon or one of us as we would like to get samples for resistance testing. We should soon be seeing the emergence of crawlers of San Jose scale (SJS), Quadraspidiotus perniciosus (Comstock) from under the overwintered adult female scale covers on apple trees. SJS has become a primary fruit pest in many orchards across the region over the past 10 years, as older chemistries such as Penncap-M and Lorsban, which once held this insect in check, have been removed from the pest management toolbox. With little in the way of residual insecticide in the orchard after the threat of plum curculio has passed, there is little to keep this insect from gaining a foothold in tree fruit blocks, which invariably leads to severe economic injury if left unmanaged. Many producers find this insect very difficult to eradicate. Multiple applications targeting all three generations using products with different modes of action appear to work best. The pheromone-based model we now use targets the adult flight as a biofix, predicting SJS crawler emergence at 380-400 DD (base 50°F). This year, the first adults were observed in traps on 11 May, accumulating 365 DD to date. Therefore, we are expected to reach 380 DD or the onset of crawler emergence in the next 1–2 days. We are quite fortunate to have a group of effective insecticides to assist us in managing this insect during key timing windows of the growing season. However, the window of opportunity for using materials such as Lorsban, Supracide 25WP and Movento for this generation has passed. Our options now include oil, contact insecticides, or insect growth regulators that will target the emerging crawlers. The use of oil at 1% has been quite effective when used alone against SJS if complete coverage is achieved. However, your fungicide program will dictate the use of oil. The fungicide Captan may cause phytotoxicity to foliage and fruit if penetrants such as oil are used in tank mixes or in close application schedules with oil. Centaur 0.7WDG, working as an insect growth regulator (IGR; IRAC Class 16), acts to inhibit the synthesis of chitin. Esteem 35WP, also an IGR (Class 7), functions as a juvenile hormone mimic, inhibiting metamorphosis from one stage to another. Movento 240SC (lipid biosynthesis inhibitor; IRAC Class 23) is also effective when applied preventively, as its systemic activity requires some time for it to become established in the woody tissues. All these insecticides are most effective when directed against the first appearance of crawlers, yet have no contact toxicity and tend to act very slowly. Assail and Admire Pro (Class 4) are both broad-spectrum neonicotinoids that can be effective when directed against emerging crawlers. The efficacy of some of these materials (e.g., Movento, Assail, Centaur) is improved by the addition of an adjuvant with penetrating properties; however, Esteem and Admire Pro can be used effectively without the use of a penetrant. Remember, rotating classes of insecticides for each generation will delay the onset of resistance. Making multiple applications of the same class or same insecticide at a 14-day interval for the same generation is recommended. Ed. note: Sivanto 200 SL (Bayer CropScience) is a new insecticide that likely has very good efficacy on scale, and may be availalble in New England states (but not NY yet). 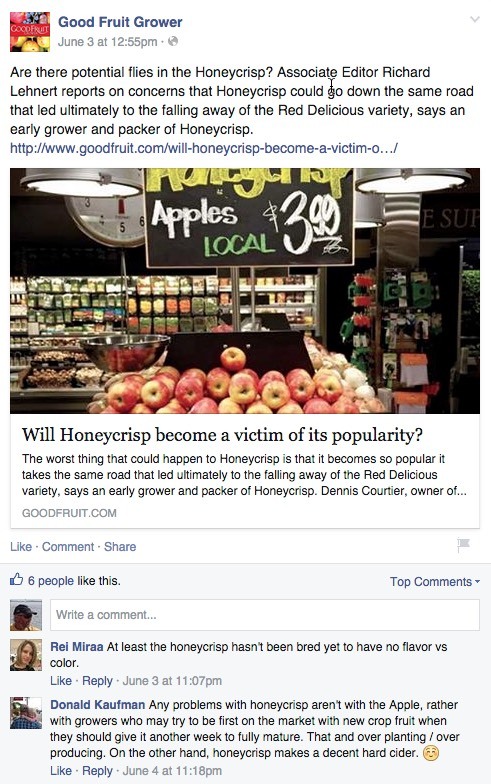 The next Healthy Fruit will be published on Tuesday, June 16 or thereabouts, 2015. As always feel free to get in touch with any member of the UMass Fruit Team (http://extension.umass.edu/fruitadvisor/team-members) if you have questions or comments.